Our Swiss Replica Watches have the same look as original watches and our Replica Rolex UK feature high quality movements. Now the latest trend is to go for fashionable Replica rolex because they are with low price and have the same look color and style as designer authentic Swiss Replica Watches.If you want your watch to be as much a piece of art as it is a piece of jewelry or a functional object, a Rolex Replica must de watches is an ideal choice!All top-notch fake cartier must de from our various websites are extremely authentic Replica Designer Handbags and guaranteed brand new. Beautiful paintings and wearable artworks (jewellery!) made with found and rediscovered objects such as Venetian glass, coins, buttons, shells or old china and glass found on the Thames Foreshore or Hampstead Heath. Working as a sculptor and painter, I explore my experience of the land and seascapes of Scotland as well as the people, animals and objects that inhabit them, often highlighting tensions in their relationships with each other and with the landscape itself. I work from memories of such places, drawing upon a narrative within. This allows me to build a composition around a theme - the title will as often inform the work as the other way round. I am a narrative / figurative carver finding the inspiration to carve the human figure or faces from the natural form of the log, tree or root. These have natural curves and strengths that help to give life and movement to my figures while I search for the story hidden in the wood. My work illustrates a passion for experimentation within a variety of media. I explore expressive methods of exploiting often rich, colourful and subtle nuances of form, light, shadow, colour and texture. I will frequently combine intensely personal abstract colour work using luminescent pigments and patination within oil and inks on canvas, paper, and silk, fibres, wood and metal. I work in a variety of media, mainly exploring the use of flat colour (with paint, coloured card and film, and glass) to generate imagery and forms. The relationship between self and the world around is a common theme in many of my pieces. My mosaics consist primarily of vitreous glass, ceramic, recycled materials and millefiori. Bold designs and strong colours lend themselves perfectly to working with this medium. Tree sculpting and wood carving. Based in South East UK as TRIBALANIMAL. Steve is looking for commissions and is able to provide very competitive quotes based on size and complexity of image. He also has an ever expanding collection that can be viewed at www.tribalanimal.co.uk. My work focuses on issues of body image in a contemporary context. I am particularly interested in how people view themselves, and how this perception has been altered by contemporary western society. My work explores the search for comfort within one’s own body. It is a common experience for people to feel out of step within themselves, as though their bodies are separate entities with the capability to betray, deceive, or disappoint them. I design, make and install stained glass windows, panels and mirrors. Clients’ wishes come first, then the needs of buildings. Site visits are usually required before designs are agreed and work begins. I enjoy mixing contemporary and traditional ideas. Techniques include printing, painting, sandblasting, computer design, and leaded lights. I also make kinetic, glass and mirror constructions for galleries. Stephen has held a life-long passion for shooting, and using Springer Spaniels has added such pleasure to the experience that it has inspired him to create a series of Game Shooting sculptures featuring dogs and their owners in action. It is that symbiosis and the dogs' obvious equal passion for shooting that he aims to capture in his sculptures. He also has a range featuring Shepherds and old country characters with their dogs and animals. Harriet Aston makes wall and floor sculptures made of industrial wrapping paper dyed, shaped, cut and gilded into forms that are linked one to another but separate. I just love the creative process, I work in any material, at any size (though usually its life-size or bigger) for any location be it private commission or public art. I have 20 years knowledge and experience in creating sculpture and love a challenge. Bob Barron's art is a deliberate remove from a digitally manipulated, glossy, advertising culture with its emphasis on instant gratification. He uses card that was once packaging for this consumerist society, and old roof slate which appeals because of its age, evidence of exposure to the elements and it's sedimentary origin. 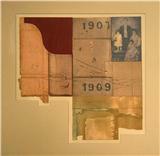 On both he etches, stains and assembles images meant to express musings about the passage of time. Ruth paints large, colourful and energetic mixed media paintings, presently focusing on nature and landscape. Ruth paints with a fusion of energy and passion, often spontaneous but always inspired by the world around her. , Ruth is well established and known for her wire and mixed media sculptures, where wire is used to transform a drawn line into energetic three dimensional sculpture Ruth’s wire sculptures concentrate on her love of animals. All my works are made from mild steel with various finishes. each piece takes approx 70 to 100 hours to complete. David is an established Etcher/Artist/Sculptor of over 30 years experience. His work reflects the personal values of skill.... hard work..and craftmanship...with some talent to master them thrown in. Ultimately, for me, art is about form and structure, about light falling on surfaces. I also see art as a means to selfhood, to a better, refined sense of self as represented in the search for formal structure. We create beautiful unique light sculptures in the shape of words for interior & display. Indie projects, too. Liviu Bora is an inventor of chimeras, or truths, made tangible through the artist's desire to shape representations of the world he has inside. I paint small trompe l'oeuil paintings relating to the books on your shelves, including some on commission. 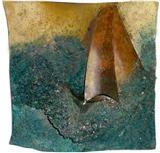 My assemblages and sculptures, also often on literary themes, are usually of a more esoteric nature. My journey started with painting in oil colours which engaged me for a long time. A passion to continually expand my experience has lead me to experiment with materials ranging from paper, yarn, fabric, and now to much harder materials like marble, mosaic, and ceramics. For the last three years I have been constructing forms in porcelain clay with a focus on making the viewer hyper-aware of the inner and outer spaces they occupy. Big Outdoor Sculpture. Public Art . Schools. 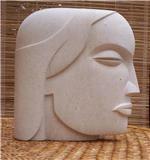 Commissions, Large scale Chainsaw sculpture, Outdoor clay firing and ceramics. John Brown creates contemporary sculptures based on the simplified human figure, ranging from small interior works to those suitable for the garden or workplace. 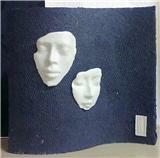 The interior sculptures are in stone or cast materials, whilst those for exterior sites are in cast materials. Commissions are accepted. Lucinda’s inspiration comes from the spirit and the body that we temporarily occupy. It is the inner qualities of peace and clarity that she is most concerned with and this is reflected in the Fragments and the newest, Serenity Collections. Brenda Burgess is an artist and portrait sculptor. For her oil paintings Brenda uses a light, calming palette that is often deeply textural. The resulting images are peaceful and ethereal . 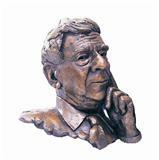 Her portraits are made in clay or bronze to commission . These are generally of loved ones , often children . 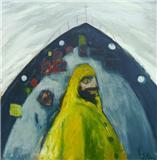 Exhibitions include The Royal Academy and The Mall Galleries. Copyright © artistsdirectory.co.uk 2009 - 2019. All rights reserved. (Images are copyright to the name of the 'registered artist' they relate to).